Last month, I decided it was time to start a new writing habit. In a blog post written last year, I explained why I write on my journal at various times of the day. It was a habit formed a long, long time ago, when I was working as a feature writer. I value the ability to write everywhere – even in the midst of a noisy and busy place, and it is one habit that I plan to continue as long as I want to write. I have been journaling since I was very young, and through the years, it had become a very therapeutic practice. But as I recounted in another blog post, I have been feeling that something was amiss – somehow journaling no longer seemed so enticing and fulfilling. Perhaps I had been doing it for so long? I was thus very grateful to have been given a scholarship by Shift Network to Mark Matousek’s course, “Writing as a Spiritual Practice.” Mark is a generous teacher – the course materials were so rich and thought-provoking. Still, I could not find the solution to my growing disinterest in journaling. I was not even interested in answering the prompts Mark gave after each lesson. When I emailed Mark Matousek, I told him I had been doing reflective/therapeutic journaling for so many years, and I felt that I had answered all the prompts in one way or another. His kind response was: “My response to your question about how to move forward is twofold. My first response is, really? You’ve really written about everything, in-depth, covered by the more than 60 prompts in this course? I don’t doubt that you’ve touched on these topics before in various ways, but these are largely open-ended questions, not things we figure out once and for all. My gut tells me that that’s not the real issue, however: you sound bored with this kind of writing, period. It sounds like you are ready to grow as a writer…” In the last half of his email, Mark suggested I try public writing for a change. After I had gotten over the big surprise of receiving such a lengthy response from a multi-awarded author, I sat down several times for many days to think about his suggestions. It finally dawned on me that he was right, I was bored with just journaling. My mentor was right, it is time to go back to public writing. I decided it was time to write my memoir (gulp). That took a lot of courage to accept, although I consoled myself with the thought that I would write it primarily as a writing exercise, without any plans for publishing it. I know, it’s being cowardly, but hey, never in my wildest dreams (and I’ve had many wild ones) did I ever think of writing a memoir. So, it was time to begin learning how to write in a more structured way. Last month, I began to learn how to write at the same time everyday. I read a lot of articles on how to begin a new writing habit but most of the articles gave the usual suggestions: plan, show up, set a regular time, set goals… none of them appealed to me because I knew they wouldn’t work for me. But one article really stood out among the rest: “Why Weird Writing Rituals Work,” by Rosanne Bane. “Robert Olen Butler observes that just like athletes, writers need rituals to distract us from thinking too much about how we do what we do. Thinking too much invariably causes a slump,” Bane explains in this article which was featured by WOW! Women on Writing. Bane writes that Isabel Allende’s rituals include lighting candles, surrounding herself with fresh flowers and incense, and meditation. These put her in the right mood to start writing. Before writing, Charles Dickens used to arrange the ornaments on his desk in a specific order. “The variations are infinite, but each writer knows his or her version of the prepatory ritual must be exactly duplicated if writing is to begin, prosper, ” said Novelist John Edgar Wideman. I have been writing regularly for one month now, at the same time everyday. My writing rituals are not so weird though: I do spontaneous Qi Gong and then I meditate. It’s amazing how performing these two rituals bring out the writer in me without any effort at all. I have even found the zest to journal again! If you are struggling with writing, I hope you’ll try having your own pre-writing rituals. They work like magic! 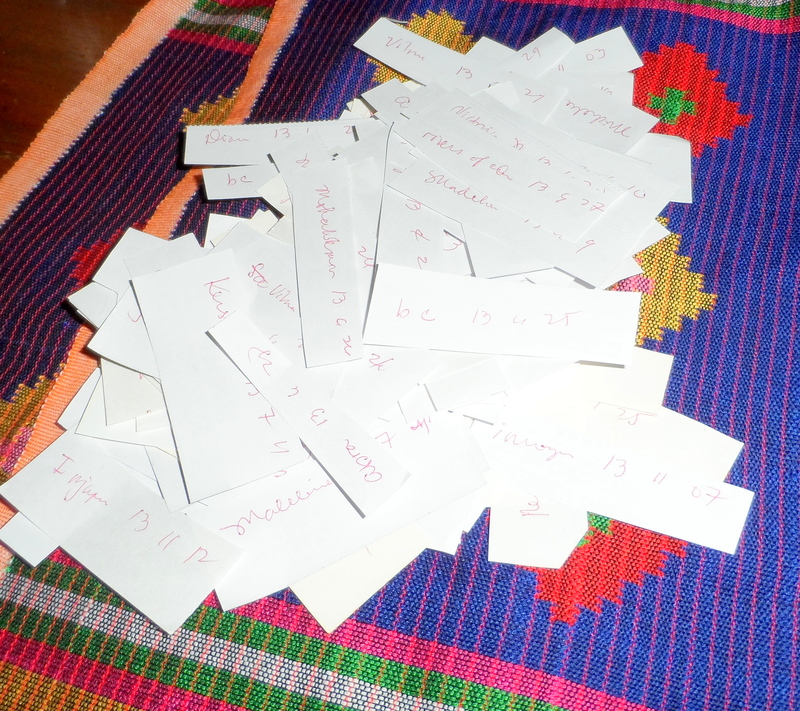 I was finally able to finish writing down the names of the past year’s commentors…more than a hundred names! My oh my, it took so long to write all the names, what was I thinking? It was so tempting to cheat and just choose one name from the WordPress.com list…but I promised I would draw lots, and I can proudly say that I did! And the winner is… Michelle Joyce Bond, who blogs at “sleeps with notebooks.” Congratulations, Michelle! Hmm. Thought provoking. I could spend a lot time thinking about creating weird writing rituals. Starting….NOW! Thanks for that inspiring article. Gave me some great food for thought and pics in my mind. A great post, very inspiring 🙂 A lot to think of.